In my recent post on travel essentials for your trip to Japan I mentioned my preference for a leather backpack as my go-to travel handbag and how it’s become a staple for my recent adventures, looking stylish, having plenty of pockets to keep everything easy to find and fitting a load of stuff while still being very comfortable to wear all day while exploring. I do have a strong preference for leather in my travel bags and hand bags. I think they look stylish and classic, they go with anything and can be dressed up and down easily which is essential when you’re travelling. Importantly it is also rugged and strong, personally I think leather looks even better with a bit of age, a few scrapes and the developing patina to show that it’s been well used and loved. While I do like the character that age gives to my leather goods I give them a good initial waterproof treatment and then repeat that at least seasonally to keep them looking good and to resist staining. It’s always recommended to test your waterproofing spray or cream on a discrete part of a new bag such as the base but I’ve always done this to my boots and bags and never had an issue. The big thing to remember if you do get caught in a tropical moonsoon or you bag gets wet for any reason just wipe it off with a soft cloth and let it dry naturally, it’s important not to rush the process by putting it next to a heater or putting it under the hair or hand dryer which can damage it more. Each Mahi bag comes with a cloth storage bag which should be used to keep it away from dust and dirt, to be honest mine are rarely out of rotation long enough to make it to the storage shelf but it’s handy to have. I purchased my current Mahi Leather Roma bag about 18 months ago from the website and it’s been in constant use ever since. I rarely leave the house without my camera and it’s perfect for that and the everyday essentials but can equally be loaded up and still be very comfortable to wear all day. There’s a zip pocket inside for extra security or to make smaller items easier to find. There’s also a very secure zipped pocket that sits against your back that I generally keep my wallet in as it’s a good size and it’s easy to access. Then there are the two external zipped pockets on the front for items you want to access during the day. The main compartment is a good size and has the security of a heavy duty zip and the flip top with magnetic clasp provides both a style element and adds to the protection of the contents from the elements. I loved the look of this bag online but wondered if it might be a little large to pass as a handbag. Having now used it for a good length of time I find it hits that right point between function and style. At least for someone like me that leads a mostly casual lifestyle and never travels light. My one drawback with the Roma bag is that while it’s build to fit a 13″ Macbook, the vagaries of computer sizing mean it doesn’t fit the slightly wider 13″ Lenovo that’s my current laptop of choice. As we’ve discusssed before I’m not someone who flys with just a carry-on, I’m happy to check my luggage which means I can be reasonably unencumbered around the airport and on the flight. That’s meant a good leather backpack is ideal for how I travel and super useful on location where I often prefer to explore on foot and public transport with a full camera kit. It also slides under the seat in front of me on the plane if I want it to so I can access anything I want during the flight without disturbing others. I only carry with me what I need on the flight plus my valuable or delicate items. As a travel blogger that can still be surprisingly close to the standard 7kg of carry-on luggage limit. My camera and any extra lenses stay with me, my phone, often my iPad, a power pack for recharging in transit, the cables for that, potentially the gimbal if I plan to do video. I also generally need my laptop if I’m away for more than a couple of days or will need to edit photos and videos on location. 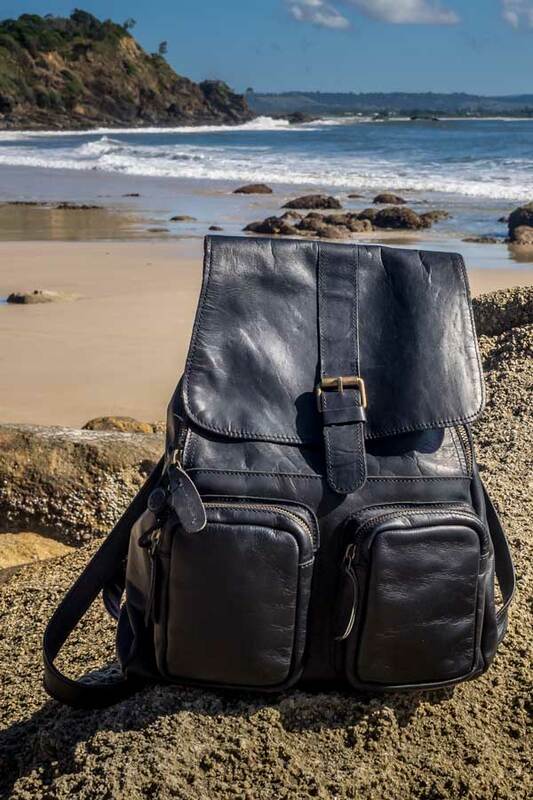 Recently Mahi bags offered me the slightly larger classic leather backpack to try out. Of course I was very happy to accept and have already had the chance to start putting it through its paces on a few recent trips so thought I’d share how this one is going. 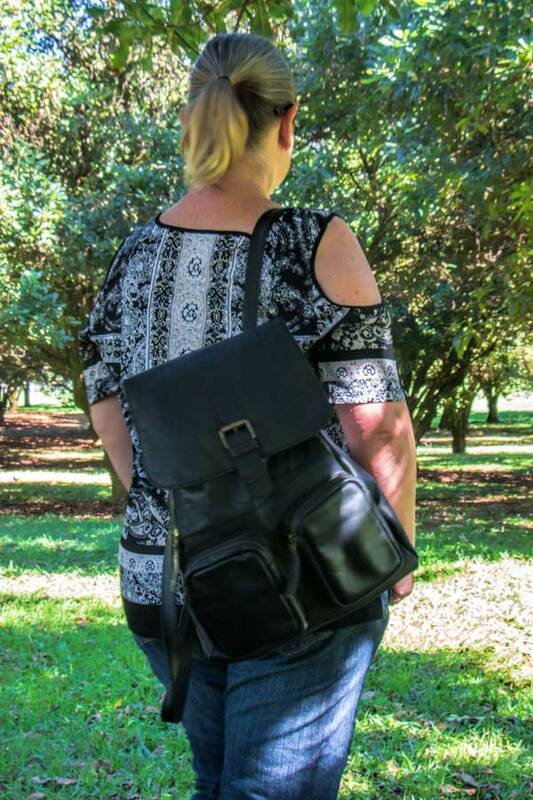 The shape of the Classic backpack is more squared off and to me feels a bit more of a unisex style and less in the handbag category that I originally sought out. It’s slightly larger so it does fit the laptop and with it’s uniform shaping it holds quite a bit more, meaning it can weigh a bit more too as I have a tendency to add what will fit. The wider leather straps help with that, distributing the weight comfortably so I can still have this on my back for a good portion of the day. I thought the best way to give an idea of the proportions was to unpack it and show you the contents, with this inside it’s not stuffed full, I can squeeze in a few extras if I need to but it covers a good portion of what I might carry. The laptop has a neoprene sleeve that I use to give it extra protection from compression or scratches. I also use the Crumpler Have camera insert bag for my Olympus OMD EM1 and lenses. I find this insert ideal as it protects the camera from any impact, has dividers inside to separate an additional lense and the little external pockets keep the spare battery and SD cards handy. Then I add all the usual stuff, wallet, phone, power pack and cables, notebook and pen, tissues, wipes, makeup, earphones and a lightweight jersey or pashmina tucked in the top. The Classic Backpack has one wide external pocket on the front which has a flap over the zip and the zip on the main compartment is also enclosed providing good protection against the elements. Inside there is a zip pocket at the back and two open pockets set into the lining at the front. The only thing I feel this one is missing that I really like with the Roma is the secure pocket against your back on the outside for your wallet and passport, I really like that feature mostly because I can locate them both really quickly. Overall I rate both bags highly, I think they look good, the price point is competitive for the materials and build quality, and most importantly I find them very functional for my use.